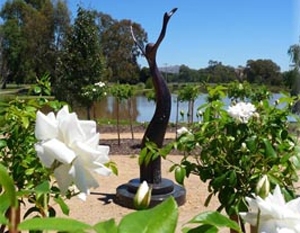 Our Celebration Garden, Belvoir Park, which was opened on 14th November 2010 and consists of Jane McGrath, Pink Seduction and Iceberg Roses surrounding a beautiful 2.5 bronze sculpture of a woman reaching to the sky. This tribute garden will allow individuals,families and the wider community impacted by breast cancer to have a beautiful and significant place to commemorate their loved one, celebrate the survival of those who have won or are winning their fight against the disease, and celebrate the lives of those who have lost their fight against the disease. Our beautiful statue was originally carved by local artist, Henry Dinning, from old tree roots and stood over a metre tall. The sculpture was enlarged and then cast in bronze. According to Egyptian mythology, the goddess was a powerful and magical healer, gifted with the ability to cure mind, body and spirit and was also worshipped as a goddess who ensured everlasting life. She was a particular protector and patron of women, guided them in childbirth, comforted them in bereavement and she affirms women as great sources of strength, healing and inspiration for each other. She shows us our own ability to heal ourselves and to heal others.